Energy Farm has complete packages starting from only $4990 including installation by our professional Clean Energy Council accredited installers and carpenters. All systems are build with quality components that allow for the monitoring of your energy production and ensure a long life for your investment. Give us the opportunity to build a package tailored to your needs and your budget. We offer free no obligation quotes 7 days a week. The inverter is at the heart of your system and like all electronic equipment there are vast differences in quality and performance. When you see solar panel packages that have a price that is substantially lower than reputable companies you will normally find they are using a cheaper quality inverter. Energy Farm only uses high quality inverters in its solar installs. We have good relationships with the best European inverter manufactures so we can offer you great prices on quality products . 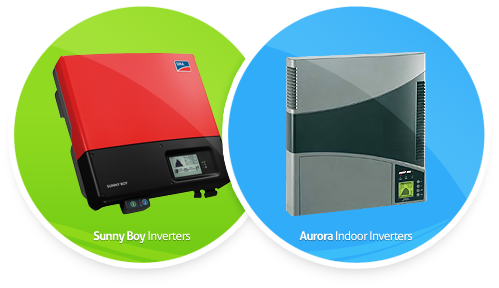 The inverter we recommend will vary depending on the size of your system and if you require an indoor or outdoor installation. Energy Farm uses exceptionally high quality Suniva monocrystalline solar panels which feature 25 year warranty for energy output efficiency to remain above 80%. While most competitors panels are rated often at 175watt or 190 watts our panels are rated at 250watt meaning more power for less panels on your roof. Suniva is an American company and world leader in cell technology making some of the most efficient panels in the current PV market. Call for further details. Many people do not think to ask about how the system will be mounted to your roof and yet this is a critical part of the whole process. After all, it is what holds your investment in place and it has to do this for decades. We proudly use a West Australian mounting system made out of the highest quality anodised components. This comes with a 20 year product warranty. Many racking systems on the market are cheap imports that do not even meet the new Australian standards that have come into place this year for mounting systems with PV Solar installs. The quality and product warranty of the mounting system should be a consideration when getting quotes for your install. Current cost ENVI meters are included free in any package above 4KW. These wireless devices let you monitor energy usage within the home as well as the energy produced by your solar system. Great to teach your kids (or yourself) about your power usage trends! The information can also be fed to a laptop and monitored using free Google Power Meter software. Energy Meters are also available to purchase at discounted prices with smaller system installs. The inverters we use allow you to monitor your energy output in real time on a screen window on the display. This in itself can be rather satisfying to see that your system is up and running properly and how much energy you are producing and money you are saving. Need to take things a step further? We can set up laptop computers or desktop machines to monitor the output of your energy production either in real time or as a monthly download. Just ask us what you want, we can provide a solution to meet your needs. After researching several companies, we found energy farm’s products and services to be the best available. The company prides itself on the professionalism of its installers, and we were assisted with all paperwork. The final result was extremely unobtrusive and efficient, at a very fair price as well as being installed in a timely manner. How refreshing to deal with a company that is passionate about what they do and so reliable from start to finish. They really listened to what our needs were and our concerns and set up a system that suited us perfectly. I would not hesitate to recommend them to others. Just a quick note to let you know that the upgrade to our existing system with more panels is exactly how I wanted it. You have done an excellent job and I will have no reservation in recommending you to my family and friends should they need solar panels. Energy Farm gave such a hands on personal approach to our project. They even came and installed an energy monitor for us before the solar install so we could get an idea of how we were using power. This helped us to decide on the system size we wanted. Just brilliant.